These Retro Wedding Invitations where designed when the sister of a very good friend of mine was getting married. 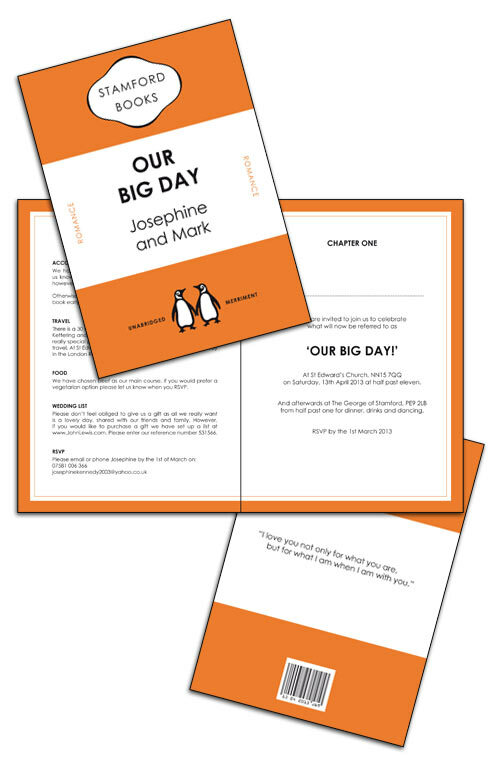 I was delighted to get involved and help her create the perfect stationery for her big day. The brides sister had already thought of a great idea which would be the perfect compliment to the Retro Wedding theme. The famous publishing company who produce their books with the animal logo were going to be used for invitations so I created a Save the Date which followed a similar design. A bookmark seemed like the perfect solution and I also combined a vintage library card feel into the design. Important dates in the couples history together were included along with the relevant details of the wedding. 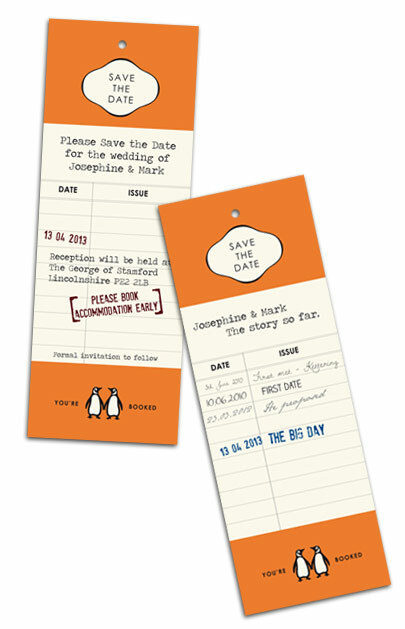 The printed bookmarks were then finished with some bakers twine in a complimentary colour before posting out to guests. The finished design looked great printed in the funky bright orange colouring with simple black text. White envelopes were supplied for mailing out to guests and along with the Save the Date were very well received. Obviously you don't need to follow this system, the design can be created to match any colour theme you're planning. Looking for Retro Wedding Invitations? If you're thinking of Retro Wedding Invitations for your big day please don't hesitate to get in touch by clicking here. Designs can be customised to suit your theme or I can even design something unique just for you.